A small Texas town best known as the home of Blue Bell Ice Cream might be the last place to expect to find an Orthodox synagogue. And yet for over a century, Brenham, Texas, has been home to a small, modest shul. The building looks like a country church from the outside, but the inside is designed in the Orthodox fashion, with a bimah in the middle of the floor facing the ark. While the congregation has shrunk in recent decades to only one couple, they remain dedicated to preserving this small town shul and the history of the Jewish community that once filled it seats. Originally known as the unincorporated community of Hickory Grove, the settlement changed its name to Brenham in 1843 in honor of Dr. Richard Fox Brenham, a hero of the Texas Republic. The following year, Brenham was named the seat of Washington County. But it was not until 1860 that Brenham began to grow significantly after the Washington County Railroad made the town its terminus. Brenham’s population doubled every decade between 1860 and 1900. According to the Handbook of Texas, “Jewish merchants helped stimulate the town’s extensive retail and wholesale trade” during this period. Perhaps the first Jews to settle in Brenham were Sam and Herman Levinson, who owned retail stores in the town by 1857. Sam and his wife Harriet were both Polish immigrants. Sam’s business was doing quite well on the eve of the Civil War; in 1860 he owned $2500 in real estate and $10,000 in personal property. Herman, likely Sam’s brother, was even more successful. By 1860, Herman owned $15,000 in real estate and $7,000 in personal property. Herman Levinson had left Brenham by 1870, while Sam and his family were still living in the town at the time of the 1870 census. Yet Sam had left Brenham as well by 1880. The Levinsons were soon followed by other Jewish immigrants who sought their economic fortune in Brenham as the town became a regional trade and distribution center. Alexander Simon left Poland in 1838, settling in Texas by 1844, living in Dallas and Columbus initially. He later fought for the Confederacy. After the war, Simon lived in Brenham, opening a dry goods store. By 1870, Simon owned $5000 in real estate and $20,000 in personal estate. Simon sold all sorts of merchandise including clothing, shoes, hats, crockery, cigars, and groceries. Simon became a leader of the local business community, with the Brenham Banner newspaper calling him “a dominant factor in the business and civic life of Brenham and Washington County” when he died in 1906. His son James later built the Simon Theater in 1925, still a landmark in downtown Brenham, though he sold it in 1940. By 1870, the Polish-born Harris brothers had their own dry goods store in Brenham. Louis and David Harris owned the store while their younger brother Henry worked as a clerk in the business. Born in Prussia, Solomon and Delia Harrison moved to Brenham from New York in the late 1860s. By 1870, Solomon was a poor merchant tailor, with only $100 of personal property. Harrison later opened a dry goods store which eventually became one of the largest in town. By the 1890s, Harrison’s was running large full-page ads in the Brenham Banner. Louis Fink opened the Fink Bros. Store in 1887, catering to farmers in the area. According to the local newspaper, Fink was well known in Brenham “for ‘carrying’ the farmer thru the bad times and have had their reward in their trade during the prosperous times.” After Louis retired in 1912, his sons Sam and Gus took over the department store which became a local institution. Around 1890, Russian-born Philip Susnitsky moved to Brenham from New York with his wife Rose and their children. Susnitsky was a peddler initially and later opened his own dry goods store. By the late 19th century, a number of Jewish merchants owned stores in Brenham’s downtown. In 1890, other such businesses included Cohen Bros. Dry Goods, Morris Cohn, Herman Fischer wholesale and retail groceries, and Fischer & Weis meat market. Both Henry Mayer and B.S. Kochanowitz owned grocery stores in 1890. By 1877, Brenham Jews had begun to establish Jewish organizations, including a B’nai B’rith Lodge and a Hebrew Benevolent Association. In 1878, Brenham Jews held Rosh Hashanah services at the Odd Fellows Hall for the traditional two days. The B’nai B’rith Lodge also held lavish Purim Balls in 1878 and 1879 which attracted Jews and Gentiles, who both dressed up in decidedly non-biblical costumes. Perhaps as a result of Wessolowsky’s criticism, Brenham Jews soon became more active in preserving their religious traditions. According to an announcement in the Brenham Banner, they reorganized the Hebrew Benevolent Society in October of 1879, promising to hold weekly meetings in members’ homes and starting a Sunday school “for the purpose of instructing the children in the Jewish religion.” Rabbi Jacob Voorsanger of Houston’s Congregation Beth Israel helped to organize the religious school and visited Brenham periodically to oversee it. He led Brenham’s first confirmation ceremony in the spring of 1880. Various other Texas rabbis would visit Brenham. 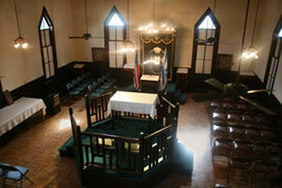 Both Orthodox rabbi Chayim Schwarz of Hempstead and Reform rabbi Henry Cohen of Galveston came to Brenham in the late 19th century to perform funerals. In 1885, Brenham Jews organized a formal congregation, B’nai Abraham, with 22 charter members, many of whom were recent arrivals in town. Louis Fink was the congregation’s first president. Early on the group met at the Second Texas Infantry Band Hall. It’s unclear if this congregation was Orthodox from the start. In 1891, Brenham Jews observed Rosh Hashanah for only one day, holding services in the Hook and Ladder Hall since they did not have a synagogue at the time. They closed their stores for only one day in 1890 and 1891. According to the Brenham Banner, a “Mr. Scarfstein” led the services in 1891, which were well attended. There is some discrepancy about when the congregation built its first synagogue. According to one local history, B’nai Abraham built a synagogue on North Street in 1892, which soon burned down and was replaced with a new building the following year. Yet according to a detailed Sanborn map for Brenham from July, 1896, there was no synagogue yet in town. Not until the next published map, 1901, does a synagogue appear on the North Street lot. 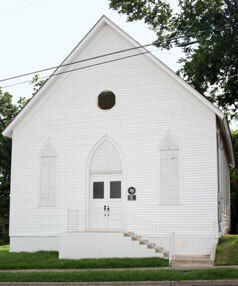 According to the Brenham Banner, local Jews held Yom Kippur services in their synagogue in 1897. Thus, it seems likely that B’nai Abraham’s synagogue was built sometime in 1896 and 1897. By 1899, B’nai Abraham had an active religious school with 12 students that met weekdays from 4 to 6 pm. Despite B’nai Abraham’s small size, with only 25 members in 1900, the congregation was able to employ a series of full-time rabbis in the early 20th century. Solomon Rabinowitz led the congregation in 1900, which met for services on Friday nights and Saturday mornings. By 1907, Samuel Kline was serving as rabbi and cantor for the congregation. Louis Katz was rabbi of B’nai Abraham in 1910. Most of these rabbis, who were probably not formally ordained, did not stay in Brenham very long. B’nai Abraham often went without a rabbi in between these short tenures. In 1917, Rabbi Wolf Willner, leader of Houston’s Orthodox congregation Adath Yeshurun, visited Brenham and helped reorganize the religious school. The last full-time spiritual leader at B’nai Abraham was Rabbi Eskin, who died in 1943, after which the congregation brought in visiting rabbis for the High Holidays. under restoration as of June, 2010. By the time its synagogue was constructed in the 1890s, B’nai Abraham was an Orthodox congregation. Men and women sat separately in the sanctuary and the synagogue had a mikvah (ritual bath). Most members kept kosher, as the congregation’s rabbi also served as a shochet. Yet because Brenham Jews owned stores and Saturday was the busiest day of the week, they were unable to be strictly Sabbath observant. Though some, like Joe Levin, tried. Joe and his wife Mary left Russia in 1892, settling in Brenham in 1897, and eventually opening a dry goods store. Although he kept his store open on Saturdays, Levin avoided having to cut string or tear paper on the Sabbath by pre-cutting and tearing these articles before sundown on Friday. If Charles Wessolowsky had found a disunited Jewish community in 1879, 30 years later, Brenham Jews had become very close-knit. A representative from Houston’s Jewish Herald newspaper visited in 1910 and found a small congregation with “all the members working harmoniously together for its welfare.” By 1919, there was a Jewish Ladies Aid Society that supported the synagogue. Brenham Jews remained concentrated in retail trade. Sam Toubin, who had left Lithuania for the U.S. in 1909, moved to Brenham in the early 1920s with his brother Haskell, opening a two-story clothing store downtown. Their younger brother Harry joined them in 1929. In 1934, when J.C. Penney opened a store in Brenham, the Toubins expanded their business to compete with the national chain. They also opened stores in other towns in the region such as La Grange and El Campo. By the mid-1950s, the Toubins owned nine different stores in south central Texas, including two in Brenham. Leon Toubin, Sam’s son, took over the family business. The Brenham Jewish community was small, and shrank during the 1930s, dropping from 69 Jews in 1927 to only 38 by 1937. Despite their decline in numbers, the congregation remained active and committed to Orthodoxy. Their services consisted of Hebrew prayers with no musical accompaniment. B’nai Abraham’s rabbi taught Hebrew school to approximately a dozen children in the mid-1930s. Leon Toubin and other young men were bar mitzvahed after studying with the rabbi. The Toubins and other families continued to observe Jewish dietary laws, getting kosher meat shipped in from Houston. Once they had access to freezers in the 1940s, they would bring in a shochet once a year to slaughter 100 chickens at once and then freeze them. After World War II, they arranged for whole cows to be slaughtered by the shochet, selling the non-Kosher hind quarters to non-Jews in town. The congregation also held daily morning prayer services. The small numbers took their toll. In 1950, the congregation tore down the mikvah due to lack of use and its poor condition. As the years went by, congregants would have to call Jews in other towns like Navasota or Sealy to enable them to reach a minyan, the quorum of ten men required to for full prayer services. In the early 1960s, the congregation would recruit Jewish soldiers from nearby military bases to make a minyan on the High Holidays, with sometimes mixed results. Multimedia: In this interview excerpt, Leon Toubin describes how the family maintained a kosher home, even in the absence of a local shochet, first by receiving meat shipped from Houston and, after freezers became available, by hiring a shokhet to travel from Houston and do the slaughtering in Brenham. Multimedia: Leon and Mimi Toubin were interviewed for the ISJL Oral History Program in 2010. In this clip, Leon describes how his grandfather, Joe Levin, negotiated religious observance of the Jewish Sabbath with the economic necessity of opening his store on Saturdays. By the late 1960s, B’nai Abraham had become largely defunct. Sam Toubin and his wife Rosa became active members of Houston’s Conservative congregation Beth Yeshurun, renting an apartment in the city where they would stay for Shabbat and the High Holidays. While there was an occasional bar mitzvah held at the Brenham synagogue in the 1970s, there were not regular services. Leon and Mimi Toubin would drive to Houston three days a week to take their children to religious school at Beth Yeshurun. While Brenham’s overall population has almost doubled between 1960 and 2010 as the Houston metropolitan area creeps ever closer, the town’s Jewish community has dwindled. The last remaining members of B’nai Abraham, Leon and Mimi Toubin, ensured that the synagogue remained in pristine condition. They led many tours of the building for local church groups and have become the keepers of the community’s history. Leon closed the last of his family’s stores in 1990, and dedicated himself to civic work. Toubin has served on the boards of the local hospital and Blinn Junior College and also helped to build a camp for kids with physical disabilities. ​ In 2014, Toubin arranged to have the entire synagogue moved to the Jewish community campus in Austin and renamed the B’nai Abraham Brenham Historic Synagogue. He and Mimi also donated land to the city for a park, which will be named in their honor. Thanks to the work of the Toubin family, the legacy of the Brenham Jewish community has been preserved.